22” high resolution HP LCD, laser printer, directly print out report in Chinese or English. All procedure becomes true automatically, view angle changes automatically, focus adjustment is automatic. The user can select report types that are acceptable for public acts and including pictures and writings. the errors or automatic alarms occur during operation is solved promptly by the system. It has been designed acceptable to standardization of counting table and it has high sentitivity. Automatic,3D, user friendship and net picture. Ⅵ.Human-machine interface and easy work. Ⅶ.Conceivable system The user can start to operate after an easy training. Ⅸ. Colour Background Technology by using special colour background technology，outline of cell are identified more easily. 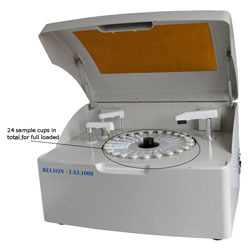 BELSON is a professional manufacturer and supplier of automatic stool analyzer in China. We offer a variety of manufacture portable ultrasound scanner, trolley ultrasound scanner, digital ultrasound scanner and digital laptop ultrasound diagnostic. We possess 10 years’ experience of producing, selling and serving. Our company’s products have been exported to Egypt, Syria, Afghan, Indonesia, Lebanon, Nigeria, Yemen, Peru, Iraq, Pakistan, USA, Canada, and Mexico. If you need automatic stool analyzer, please contact us and we hope you can visit our factories by yourselves. You can by T/T, D/P, L/C, Western Union, Credit Card, and Paypal to complete the transaction.